Spellshot is an appcessory board game in Hasbro’s zAPPed toyline. 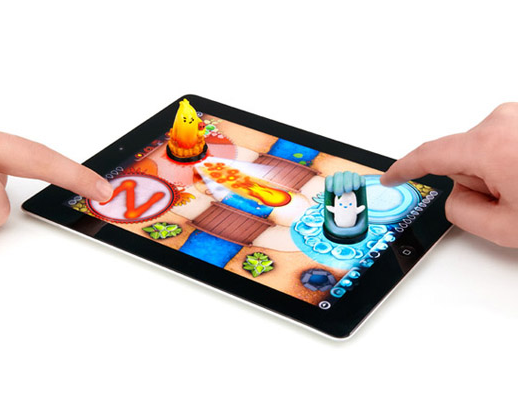 Each player controls an elemental wizard figurine which is moved on an iPad as in a board game. Competing for treasures, players then cast spells by drawing runic shapes on the touch screen. Spellshot is a two-player turn-based game in which players compete in collecting a certain number of treasures. The game is played by moving wizard figurines on iPad. Each figurine has three contact points on its base in different configurations. This lets the iPad and the app recognize the character. Players can cast different types of spells (3 in the basic game, 5 in the advanced game) by tapping a spell and then quickly drawing a corresponding shape. The four wizards, representing the four elements, each have different shapes to draw for their spells, and slightly different abilities. On their turn, players move around within the areas they have claimed, while the territory will automatically expand a small amount around player’s ending position. Players either collect a treasure, cast a spell, or pass. Some spells will do things like enlarge your territory or grab treasures. Each wizard also has a shield and two attack spells: one traps the other player so they can’t move next turn, and the other reduces their spell power. Categories: Mini Case Studies | Tags: Appcessories, Hasbro, les editions volumiques, zAPPed | Permalink.